Scientists have discovered a star that is a staggering 9 billion light years from Earth, the farthest star ever found. In an astonishing new discovery, astronomers were able to find a star 9 billion light years away with the Hubble Space Telescope, which would make it by far the farthest star ever spotted. They were able to see the star using a technique called gravitational lensing, which allowed them to magnify the star 2,000 times using the gravity of a massive galaxy cluster that bends the light from the star. Scientists have named the star MACS J1149+2223 Lensed Star 1, which is not exactly a catchy name for such a significant star. Scientists have nicknamed it Icarus, after the mythological Greek hero who flew too close to the sun. Icarus is more distant than any other lone star scientists had detected in the past by a hundred times. 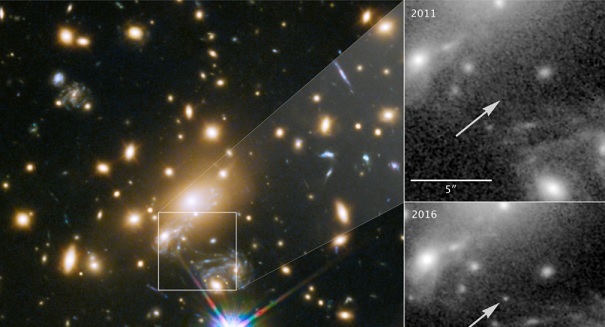 Scientists who were studying Hubble images of a distant supernova in 2016 noticed a faint dot that was not there a few years ago in the same image. They believe it to be a blue supergiant star, a remarkable find since usually only incredibly bright supernovas are visible at such extreme distances.